Would Ending the Mortgage Interest Deduction Reduce the Racial Wealth Gap? Matthew Desmond has a piece at the New York Times about homeownership and inequality. In it, he rightfully takes on the Mortgage Interest Deduction, a tax expenditure that unfairly benefits those who own homes and the rich especially. Desmond ties the Mortgage Interest Deduction, and homeownership policy more generally, into the racial wealth gap. This naturally raises the question: would ending the mortgage interest deduction actually reduce the racial wealth gap? In his piece, Desmond endorses the plausible theory that the value of the Mortgage Interest Deduction gets capitalized into home values. This means that home values are higher than they would otherwise be, which drives up the wealth of those who own homes. It’s impossible to say how much, but a widely cited 1996 study estimated that eliminating the MID and property-tax deductions would result in a 13 to 17 percent reduction in housing prices nationwide, though that estimate varies widely by region and more recent analyses have found smaller effects. The MID allows home buyers to collect more after-tax savings if they take on more mortgage debt, which incentivizes them to pay more for properties than they could have otherwise. By inflating home values, the MID benefits Americans who already own homes — and makes joining their ranks harder. On first glance, it is easy to see why someone would think that trimming home values by as much as 17 percent would reduce the racial wealth gap. 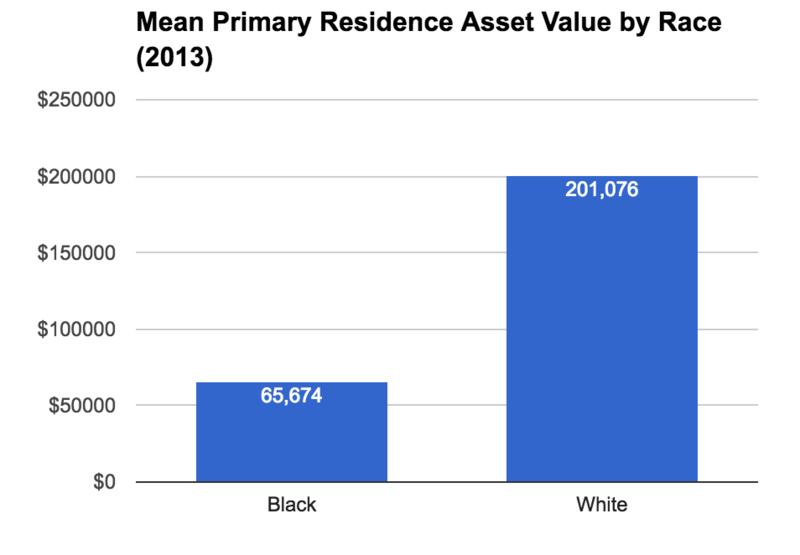 In the 2013 Survey of Consumer Finances, the mean primary residence asset value for whites was more than three times the mean primary residence asset value for blacks. This means that trimming home values by, say, 10 percent would reduce mean white wealth by just over $20,000 while only reducing mean black wealth by a little over $6,500. So, in absolute dollar terms, the racial wealth gap would definitely shrink. But the racial wealth gap is not usually represented as the dollar difference between white and black wealth. Rather, it is represented as the ratio of black wealth to white wealth. And for that racial wealth gap, it is the following graph that actually tells us whether trimming home asset values by eliminating the Mortgage Interest Deduction would help. 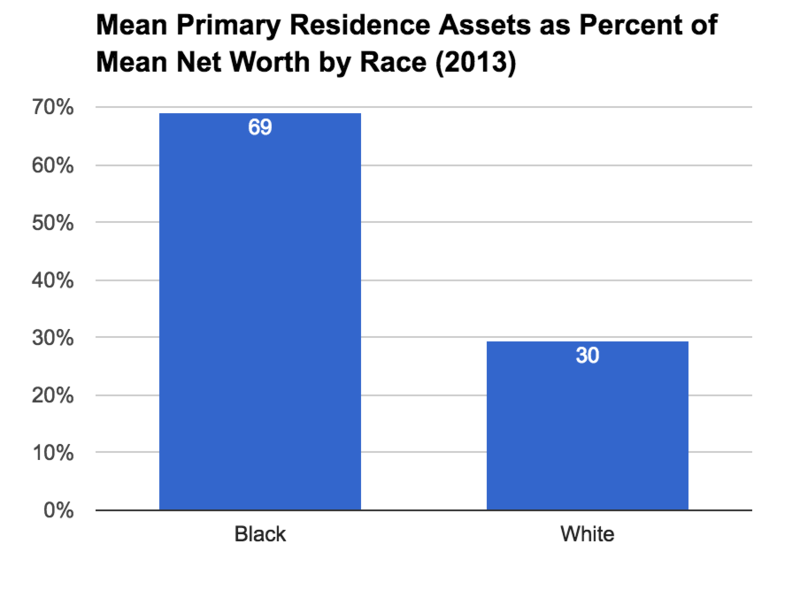 The value of primary residences makes up 69 percent of black wealth but only 30 percent of white wealth. This means that trimming all home values by, say, 10 percent would erase 6.9 percent of black wealth but only 3 percent of white wealth. The result of this would be a decrease in the ratio of black wealth to white wealth. That is, the result would be a larger racial wealth gap, so defined. None of this is to say that we should think twice about eliminating the Mortgage Interest Deduction. We shouldn’t. It is just that its effect on the racial wealth gap is more muddled than often suggested. Tweaks like that are not likely to deliver the kind of racial equality we seek. For that, we will ultimately need an intentional agenda of leveling out the wealth distribution in society. Wouldn’t it make more sense to make the MID regressive in its benefits as the value of the home increases? Or better yet, give a tax credit to people who don’t have mortgage interest,. As for the racial wealth gap, at the very least, this country should provide reparations to those at least directly harmed by redlining and other racist policy that created a lot of modern inequality. Please adjust that graph by income or show the data by income quantile. Equating primary residence equity with “wealth” is very flawed reasoning. While you and I can cash out our savings with relative ease, it is more difficult (or even impossible) for lower income people to access their “home equity”.